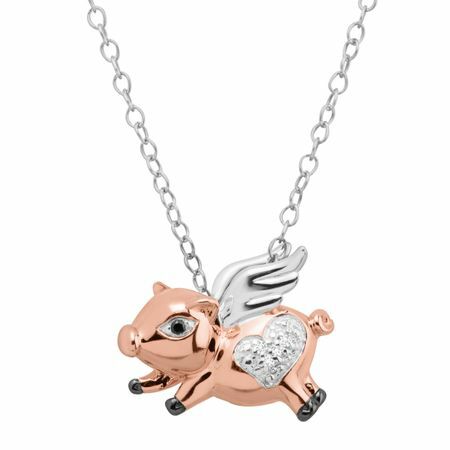 Have some fun with your style with this flying pig pendant! The 18K rose gold-plated sterling silver body is accented with white round-cut diamonds with a singular black diamond as the eye, and features black rhodium plating on each foot. The wings are crafted in rhodium-plated sterling silver for lasting shine. Piece measures 1/2 by 9/16 inches. Comes with a rhodium-plated sterling silver 18-inch cable chain with a spring ring clasp.